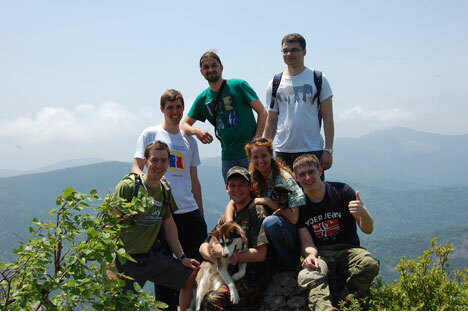 Jakub Kachelmaier (left in green T-shirt) and friends with Russian hosts on a mountain outside of Vladivostok. Source: From personal archives. Frugal foreigners looking for adventure get a heavy dose of hospitality and one-of-a-kind insights into Russian life. Jakub Kachelmaier, a student from Poland, recently spent a few months in Eastern Siberia. He didn’t know anyone there, yet he hardly spent any money on accommodations during his tour. “All we needed was a space on the floor for our sleeping bags,” said Kachelmaier. The concept of hospitality exchange came to Russia through Servas Open Doors, an international organization founded in 1949. Servas began working underground in the Soviet Union in 1980. After Servas, other hospitality networks started to appear. Today there are more than one hundred all over the world, of which couchsurfing.org is the largest, with around 5 million members. The Russian community is large, with 40,000 registered online members. Almost half of all Russian members of couchsurfing.org live in Moscow and Saint Petersburg. Kachelmaier has traveled to Vladivostok, Khabarovsk, Chita and Ulan-Ude with the help of hospitality exchange networks. “I started looking for couches two or three weeks before the date of my arrival. I wrote messages asking for a place to stay for the night. Sometimes we would receive invitations after just a few days, although some cities were a little more difficult, as there were fewer couch surfers. It really helped that I spoke Russian as it was easier to find couches.” Some couch surfers found that many of their hosts spoke English, although not all. In large Russian cities the approach to couch surfing is similar to that of European cities, a fact that is well-known among travelers. However there are also certain areas of the country where “travelling by couch” can mean something a little different. It mainly depends on the nature and mentality of the locals, as well as how well-developed the tourist infrastructure is. couch surfers are registered in Russia. There are 5 million worldwide, but most couch surfers live in the U.S.
was the year the couch surfing website was created; within a few months, the first Russian users had registered. couch surfers live in Moscow, while another 8000 live in St. Petersburg. In Russia, most couch surfers are female. Elina Valieva is one of the few couch surfers in North Ossetia. She works in public relations and spent around a year living in Europe. This year, she decided to invite a foreigner into her home for the first time. Valieva has hosted English teachers from London who were traveling in the Caucasus. “At times situations arose which reflected the particularities of life in the Caucasus.” She recalled one English teacher who couch surfed in her home. “We made him food and took care of everything. My mother even managed to do his laundry. He didn’t pay for anything during his three-day stay with us, which is nice for us because in the Caucasus, hospitality means you shouldn’t let your guests pay.” However later he seemed to find all the help too controlling. Valieva wondered, is there such a thing as too much hospitality?